Teenage black girls don't receive nearly enough credit for the vital roles they have played in shaping or better yet sustaining aspects of African American literary and cultural history. If they did get their props, literary and cultural historians would be obligated to acknowledge young sisters for helping keep several important black poems on the minds of listeners over the decades. In particular, I'm thinking about Nikki Giovanni's poem "Ego Tripping." If you lived in a black community anytime from let's say the late 1970s up through the 1990s and possibly the present and you attended a few of those black pageants or enough church programs, chances are you probably heard a recitation of Giovanni's "Ego Tripping." One of the first print-based versions of Giovanni's "Ego Tripping" appeared in her book of poetry ego-tripping and other poems for young readers in 1973. The book included illustrations by George Ford. 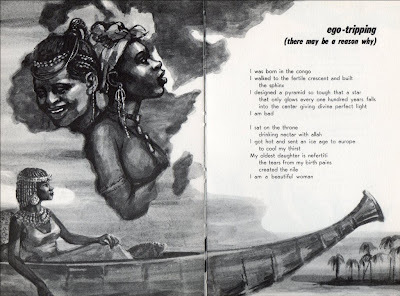 The book and poem were produced in the context of the Black Arts Movement, and as a result, the poem contains hall-marks of the movement such as celebrations of Africa and black history and affirmations of black pride and self-determination. I imagine black parents interested in Giovanni and poetry and more importantly, those parents and family members interested in building positive self-esteem shared "ego-tripping" with their children, especially their black girls. In retrospect, it's notable that the poem's publication in the Giovanni book included illustrations, thus making it even more memorable. "Ego-Tripping," with its strong, confident black woman speaker, is the kind poem you passed around in African American communities. It's the kind of poem the young sister would read at the program over at First Missionary Baptist Church. It's the kind of poem the lil sister would recite during the talent competition in the pageant put on by those black sororities. If you were in a community where "Ego Tripping" was recited at a program, you probably heard the poem's younger sister named "Phenomenal Woman." And you probably know of "Ego Tripping's" grand-mother named "For My People" or her great-grandma named "Mother to Son." In addition to including the line "I turned myself into myself and was / jesus," there's another reason Giovanni's poem was routed to and through the black church. In 1971, Giovanni recorded an album of her poetry, including "Ego Tripping," where she was accompanied by the New York Community Choir. She had an album release performance with the choir at Canaan Baptist Church in Harlem, where there were about 1,500 folks in attendance. Hold on. Imagine that--a poet having an album release gathering at a church and drawing more than 1,500 people.Incredible. So the poem was linked to black church community. And during the early 1970s, Giovanni was on a rigorous speaking schedule where, in some years, she gave more than 200 "readings." By the late 1970s and well into the 1980s, Giovanni's "Ego Tripping" was moving around black communities most often through the performances of teenage girls. Just in case readers needed a new illustrated version, a twentieth-anniversary edition of ego-tripping and other poems for young readers was published in 1993. During the 1970s, editors led the way in making Giovanni's "Nikki-Rosa" one of her most popular print-based signature poems by frequently reprinting the piece in several anthologies. Teenage black girls, however, were taking the lead in keeping "Ego Tripping" alive as Giovanni's most popular signature poem in oral culture. When and if you see young women reading "Ego Tripping" and "Phenomenal Woman" aloud at church or at a pageant, you'll see them reciting it from memory, or as we like to say, "by heart." And the sisters always get you from Giovanni's opening line: "I was born in the congo." Whew. Think about how that sounds at a lil black church or the black cultural center or school auditorium where the pageant is taking place. A young black girl takes the stage and goes "I was born in the congo." The gifted and generous performers always pause after "congo," because they know the audience needs a second to let it sink in. Or, the speaker is compelled to pause as the audience responds with things like "ALright!" Or "Come on now!" or "Amen!" Not, "I'm from Africa." No. "I was born in the congo." Those young sisters were coached on and practiced saying that opening line, the whole poem in fact, with confidence. By the time they reached the closing lines of the piece/performance and announced that "I mean...I...can fly / like a bird in the sky...," you believed them. I was at the second Furious Flower conference some years ago, and as Giovanni neared the end of her reading, she went "I was born in the congo." Folks in the audience cheered, as we recognized what poem we were about to hear. As Giovanni moved through the piece, I realized that she wasn't reading alone. There were all these African American women , that is, all these former teenage black girls, reciting "Ego Tripping." They knew it by heart.